I had a glut of tomatoes and green chillies and saw a version of this recipe in the paper – it’s something I have never come across before. The taste is fabulous – rich, pungent and spicy and great with eggs, curries and rice dishes. Easy to make and will keep, unopened in the fridge, for six months or more. I used a food processor to grate the garlic, chilli and ginger and then the blade to chop up the tomatoes so the preparation was easy. The recipe is adaptable to your own taste. 1.Heat oil in a heavy based pan and add mustard, turmeric, cumin and chilli powder. 2. Stir and cook for 3-4 minutes, being careful not to burn spices. 3. Add minced garlic, ginger and chilli and cook for a further five minutes. 4. Add tomatoes, salt, vinegar and sugar, reduce heat to low and simmer for 60-90 minutes, stirring occasionally until sauce thickens and oil comes to the top. 5. Remove from heat and store in sterilised jars. 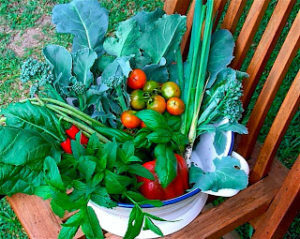 Indian Tomato Chutney recipe is a wonderful taste and good for health. 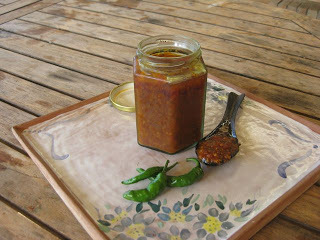 Different taste of this Chutney recipe is very delicious and thanks for posting. Made this yesterday and it turned out beautiful. Has a lovely flavour and you can taste the ginger which I love. I decided to make it again today but I wanted to make it hotter more like a curry. Added double the chillies, double the spices alittle more sugar and some indian curry powder. MMMM is amazing. Thanks for the recipe!!! Thank you so much Di, As I live in N.S.W,I think it will do very well in a cool place. I will be making it to-day so I'll let you know how it will keep. Hi I would love to make this Kasundi, does it only keep in the fridge or can it be stored in pantry? Will definitely try this, Di!